Jayne Taylor -- mother of Jeff -- submitted this one. 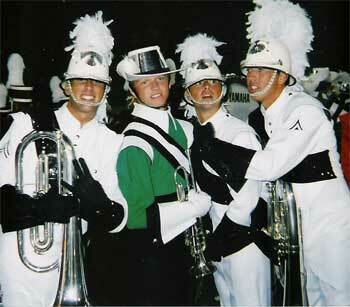 "The four guys pictured went to the same high school and marched in band together (Cleveland High School in Cleveland, Tenn.) They are (left to right) Daniel Grass (Phantom Regiment), Jeff Brown (Cavaliers), Justin LeCroy (Phantom Regiment) and Justin McElhaney (Phantom Regiment). This was taken in a 16-beat break on the field during the Tour of Champions when the guys found themselves this close together in the drill. I hope you enjoy it." Thank you Jayne!